carbonaramara: I made french toast today! These were a bit undercooked, I think. So I toasted the next batch longer. This looks better. :) And had better texture, too. My husband's addicted to Facebook's Cityville. His colleagues are also. Recently, Cityville opened up another island for habitation so Ronjie has also recently started putting up structures/business in the new island. Like starting over again, city-building anew, in some way. Oh, the thrill! 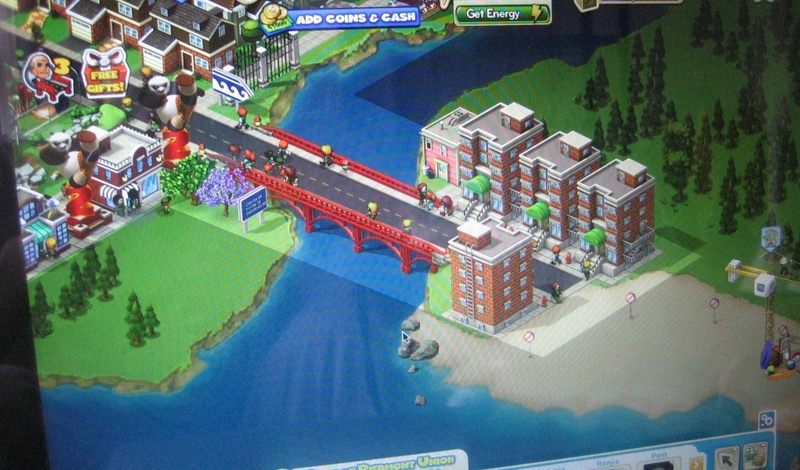 Here's a partial photo of his Cityville (stolen shot!) -- see the development in the new island? So far, there are 4 apartment buildings + a pub. And still some ongoing construction. (See the tiny people crossing the bridge? Cute!) For the longest time, Ronjie's been pestering me to join Cityville--"then we'll be neighbors!"--hmmm... I might join soon... There's a kind of excitement in urban planning, building structures, making "money" and watching your tiny citizens go about their everyday activities (while you laugh the "Muwahahahaha!" laugh). While Ronjie was Cityville-ing, I was making paper flowers, thanks to Ria. :) I'm done with 2 already, can't wait to make more! I want a flower ball. The sun is out today! Laundry time! hahaha oo nga, pag tinignan mo yung wall ni ronjie, puro cityville laman! diba adik ka sa sims dati? mukhang maaadik ka rin dito. haha. pag naadik ako, ikaw naman kukulitin ko na mag-cityville din! hahah!